Indian cinema is not just about Hindi cinema. All the films made in various local languages in India come under Indian cinema. India is a land of diverse religions, civilizations and beliefs. People of different religion, customs and traditions live here .Their apparel and cuisines are different. Hundreds of different languages are prevalent here, out of which films in more than sixty languages are produced locally. Films based on regional languages manifest the reality of peoples life by highlighting their family and social background and its issues. The Indian film industry has moved through several stages of extension thereafter and ventured into production of regional language movies. Thus, to know about the detailed information of Bhartiya Cinema, the study of regional language films is indispensable. This book has been composed keeping this objective in view. The book contains full information about the history of Indian cinema from 1896 to2015. The book deals firstly with Hindi films since the history of Hindi films is as old as Indian films. Most of the regional films were produced later. The illustrations in the book give all the information about Hindi films which are helpful in the understanding of the development of Indian cinema such as the environment of that period, situations, tendencies, changes occurring during the development, technical development, changes in the interest of audience and creation of rules related to government control etc. Thus, we get a glimpse, if not the whole, of Hindi films and the information of regional films that constitute the entirety of Indian cinema. The multilingual Indian films serve as a Kaleidoscope where multifarious reflected designs and colored pattern emerge as we get while turning it. The book has been aptly titled Bhartiya Cinema ka Itihasbecause of the inclusion of the history of regional language films as well. The reader gets the whole scenario of Hindi and regional movies at one place. With the inclusion of even two or three regional films made so far in certain languages in the book, the reader living in any territory of India gets the information about the linguistic history and development of films made on his region. The Indian film industry has witnessed certain notable changes over the past several years. From the first screening of cinema in India to 1913 when the making of first Silent feature Film was produced by an Indian totally made with indigenous resources. By the year 1930 only salient feature films were made. The silent era came to an end when the year 1931 marked the beginning of the Talkie era. From then onwards films were clearly disguised on the basis of their language. This division is also mentioned in this book. Thus the book deals with the description of Hindi films with the information of the changes and development occurring in the film industry and the history of different regional languages films thereafter. 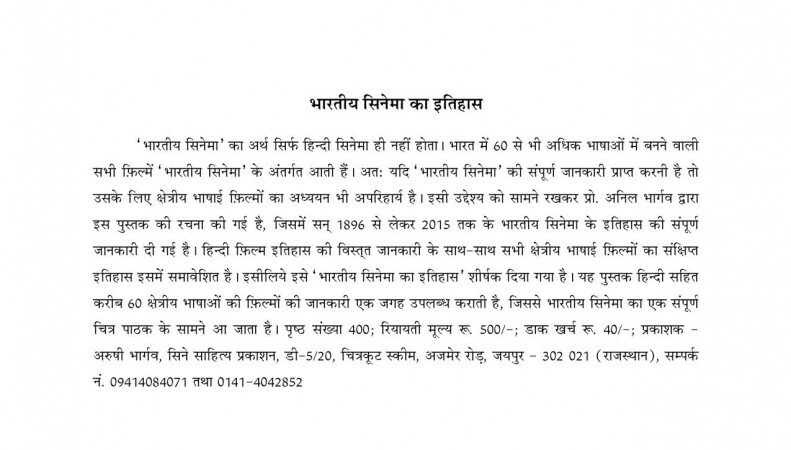 The book “Bhartiya Cinemas Ka Itihaas” may be purchased by sending the amount Rs. 500/- ( Rs. 40/- Postal Charges Extra ) thru M.O. or thru a demand draft in favour of ARUSHI BHARGAVA, JAIPUR, on the address Ms. Arushi Bhargava, Cine Sahitya Prakashan, D-5/20, Chitrakoot Scheme, Ajmer Road, Jaipur 302 021 (Rajasthan). 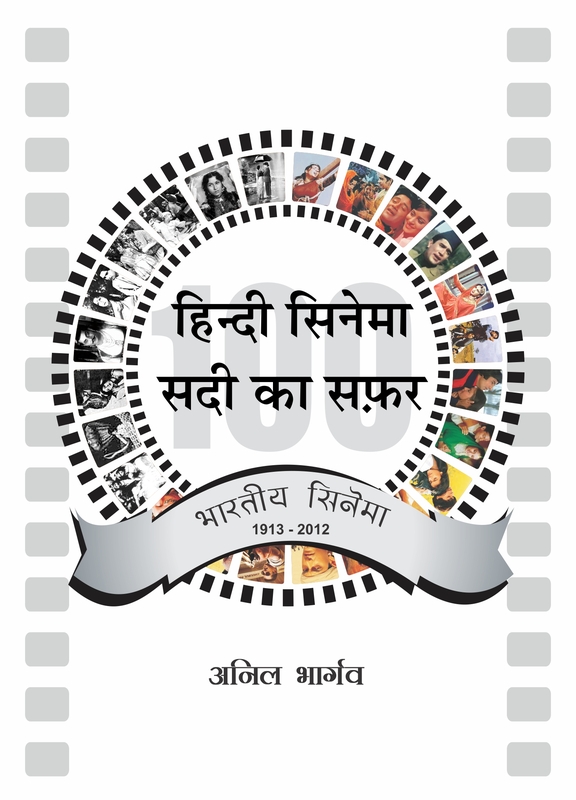 The book, written by Anil Bhargava, has collection of 100 best movies of Indian Cinema. These books are selected from different sources and are sorted on the basis of many factors like historical importance, social values and literature. 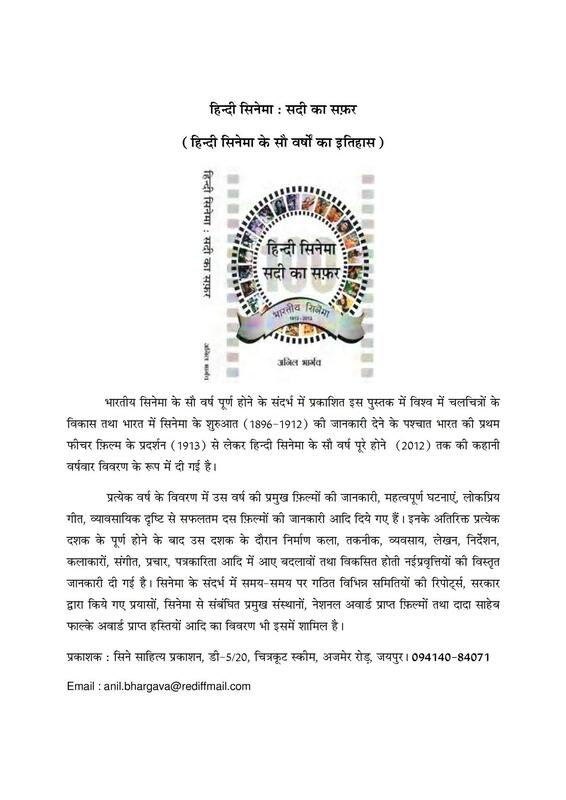 The book “Sadi Ki Sau Sarvshreshta Filmein” may be purchased by sending the amount Rs. 400/- ( Rs. 40/- Postal Charges Extra ) thru M.O. or thru a demand draft in favour of ARUSHI BHARGAVA, JAIPUR, on the address – Ms. Arushi Bhargava, Cine Sahitya Prakashan, D-5/20, Chitrakoot Scheme, Ajmer Road, Jaipur – 302 021 (Rajasthan). 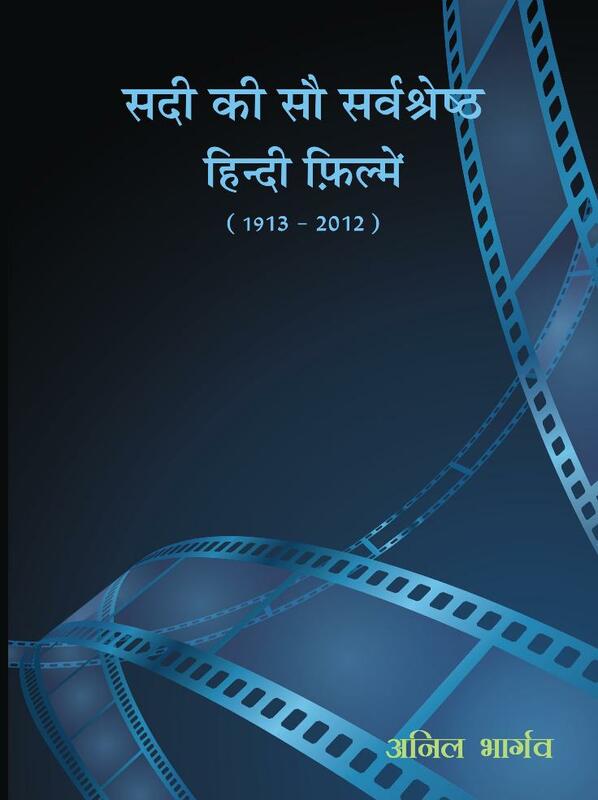 The book Hindi Cinema : Sadi Ka Safar is being published on the occasion of centenary of Indian Cinema. This book revisits the history of 100 years of cinema in India and explores the historical aspects of the development of World cinema (1695-1895). It mainly deals with the early history of Indian Cinema (1896-1912) and year wise summary of Indian Cinema, particularly the Hindi Cinema from the release of first Indian feature film (1913) up to the completion of 100 years in 2012. The yearly description of films in the book includes the summary of important films, major events, popular songs and also top ten films of the year from the point of view of business in India and abroad. In addition, after each decade, a relevant detailed general account of films is given that includes the changes & development in film making techniques, film-writing, direction, sound recording, music, publicity methods, cine-journalism, artists, box-office report, foreign market, changing Bollywood trends etc. 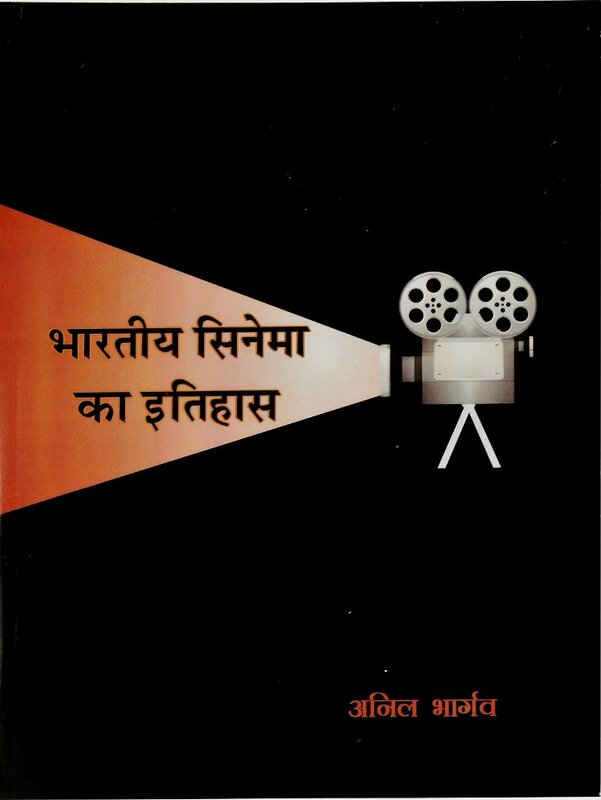 The book contains information about the reports of various committees constituted to survey & to suggests proposals for improving conditions of Indian cinema, and brings into focus the various efforts made by the government for development of cine industry, important institutions related with cinema, National Award winner movies and Dada Saheb Phalke Award winner personalities. The book may be purchased by sending the amount Rs. 640/- thru M.O. or thru a demand draft in favour of ARUSHI BHARGAVA, JAIPUR, on the address Ms. Arushi Bhargava, Cine Sahitya Prakashan, D-5/20, Chitrakoot Scheme, Ajmer Road, Jaipur 302 021 (Rajasthan). 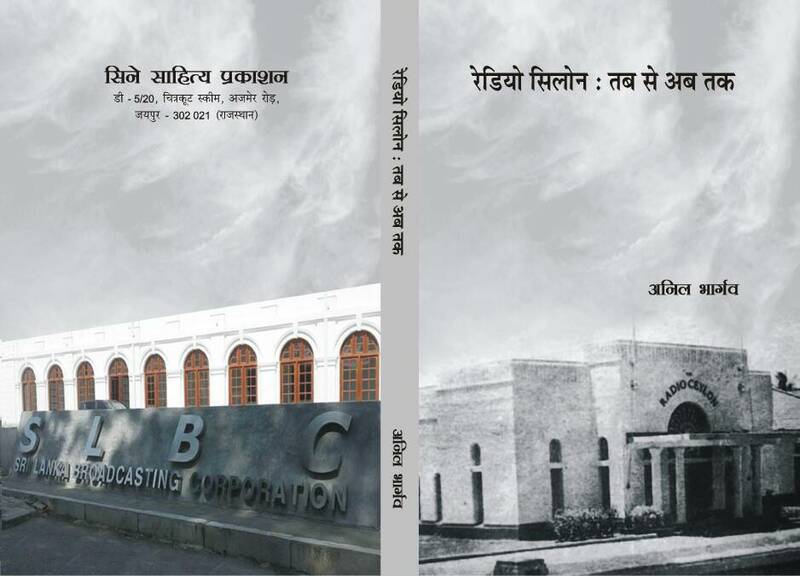 New Book “Hindi Filmon Ke Geetkaar” Launched. As the title of the book indicates, the book is related to the lyricists who penned the memorable songs in hindi movies. It includes the biography, contribution to cine music, important films, awards won and popular songs of more than 200 lyriclsts who penned memorable songs in hindi movies from 1931 (the beginning year of talkie movies) to 2011. The book also includes some information of around 1200 lyricists in brief, who wrote in a few films only.